Ahh...May. For die-hard fans of local produce and foods that have been sustainably grown, caught, or farmed, May marks the end of the dry spell, as the Bellevue Farmers Market opens Thursday the 13th for its seventh season. This year, the Thursday market returns to its original location in the parking lot of First Presbyterian Church of Bellevue at 1717 Bellevue Way Northeast. As usual, the Market will run from 3-7pm. And, as usual, it will feature the best in fabulous food, from seasonal fruits and vegetables to artisan cheese to pastured meats to fresh eggs to baked goods! Starting June 5th, the Market will also run on Saturdays, in the parking lot at 10610 Northeast 8th, near Washington Square, from 10am-3pm. The Market has become the popular place not only to buy food for the week, but also to grab a bite while you listen to toe-tapping music or watch one of the chef demonstrations. You can chat up the very person who grew your food, run into friends and neighbors, or just grab a bouquet of the famous flowers. 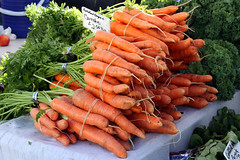 With its 61,000 total visitors in 2009, the Bellevue Farmers Market is no fly-by-night operation. Ask Director Lori Taylor. "Market days are very long," she says. "The A-boards start going up around town by 6:30am, and I'm down at the site working on signage and chalking up the day's site plan." At noon the volunteers turn out to help with set-up. Last year the volunteer pool ran to 56 members, about 15 of whom would show up on a given market day. "More volunteers are always, always welcome," Taylor says. It's the volunteers who both set up and tear down all the trappings, including canopies, tables, weights, electrical cords, and garbage cans. Farmers and vendors are admitted at 1pm, and Taylor calls getting them in and directing traffic "teamwork and choreography." Throughout the day, Taylor tries to have personal interactions with each farmer and vendor. With the expanding number of farmers markets in greater King County, local producers have more options and can be pickier about which markets they participate in. Fortunately for us in Bellevue, our market has been a strong and growing performer. The hours go by. Shoppers stuff baskets and tote bags; children beg for pizza or gelato or cookies or berries; everyone enjoys the free samples and mourns when the farm-fresh eggs sell out. Before closing, the donation baskets for Hopelink are going around, and volunteers start on clean-up and tear-down. When Lori Taylor finally shuts and locks the last storage shed and heads home, it's usually after 9pm. Another market day down, a few dozen more to go! Local writer Christina Dudley blogs for the Bellevue Farmers Market as the Urban Farm Junkie and is the author of two novels, Mourning Becomes Cassandra and The Littlest Doubts. She can be reached at christinadudley@gmail.com.